MCOOL has become a reality for the US, Canadian and beef industry. Sometimes it is beneficial to better understand an issue or situation by stepping back and examining how we got here. I asked Dennis Laycraft of the Canadian Cattleman’s Association at the International Livestock Congress to provide me with a history of the MCOOL legislation and what could of been done differently. Dave Russell and I met on Twitter and continue to communicate through this great tool. If you are interested in seeing my Twitter feed check out @shaunhaney. Yesterday, Rick Cassson, MP Lethbridge hosted Federal Agricultural Minister, Gerry Ritz in Lethbridge. On top of serving at the Farm Credit Canada Breakfast at Ag Expo and meeting with a farmer round table, Ritz also announced 15.5 million in funding for the Canadian Triticale Biorefiniery Initiative. I participated in the farmer round table where all twenty of the producer participants had a couple minutes to voice their opinion on any given subject. This is the first time I have met the Honorable Mr. Ritz but I have to say that he appears to be a very fast on his feet, intelligent and has a very firm grasp of the subjects at hand. Based on his opinion of the Canadian Wheat Board alone I think that we are in good hands. I cannot say that I agree with him on all subjects but you should never expect that. The issues brought up at the round table were country of origin labeling, the creation of the certified seed tax incentive, farmers wanting a choice on how and where to market their grain, the inability of the Canadian Wheat Board to manage its finances, the inadequate rail system in Canada, consolidation of the beef industry, how to create a long term sustainable sugar beet industry, the need for public plant breeding, the need for own use allowances on certain animal drugs and crop protection products, pollination research needs, wildlife control as it pertains to sheep production, transgenic wheat and many questions about the need for government stability programs to be bankable going forward. Afterwards I reflected to a good friend that it was great to meet Gerry Ritz and get some of his candid feelings on the issues as he really encouraged to be challenged and given ideas on how things can be improved. Thank you Mr. Ritz for taking the time to come to Lethbridge and listen to our Southern Alberta concerns. I have no problem debating with the NFU over whether or not the Competition Bureau should approve the sale of Lakeside to XL. I definitely have my opinions on it and so does the NFU but boy have they wore out their welcome by spending collaborative time with R-Calf. From the moment that the story broke last week the fire is burning under their feet as farmers and the media want answers as to why they would even be talking to the Canadian cattleman’s number one enemy. As a result ever since Kevin Hursh of Hursh Communications wrote about the meeting the NFU has been trying the separate itself from R-Calf. My personal opinion is that finally the NFU has done something to show just how radical and ridiculous it is willing to be to accomplish its goals. I think that it is fine to debate over issues like the Canadian Wheat Board, GMO vs non-GMO and whether or not there should be captive cattle but this latest stunt has a lot of people wondering where the NFU’s interests really lie. R-Calf’s mission has been to close the US border to Canadian beef and has willingly drug the Canadian beef product through the mud for a decade. You cannot attend a meeting with the most radical agricultural group in North America (R-Calf) and then afterwards say you have nothing in common. The funny part is that two NFU Board members were quoted at the conference basically celebrating the collaborative efforts of the two groups and about how much they have in common. If the NFU had any hope of getting the Canadian cattle sector on board with its challenge to the Lakeside sale it has been evaporated whether they were going to work more closely with R-Calf or not. It appears that for once in the NFU’s history they are having a hard time spinning the story and have weakened their position with Canadian farmers and cattleman forever. 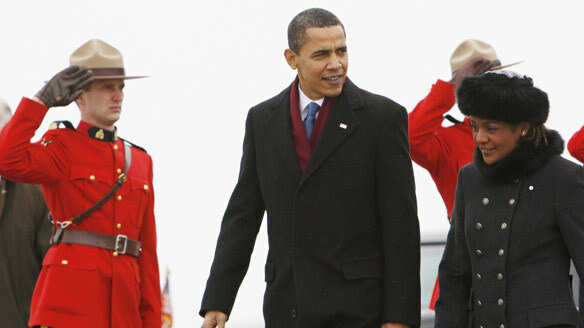 Today, President Obama visits Canada and sits down with Prime Minister Harper. Currently, the Democrats are using the poor economy as an excuse to push their protectionist agenda forward. Canada and Mexico need to be very aware of what is transpiring and how it will affect agriculture in the future. Please do not think that the steel and iron “Buy American” clause incident two weeks ago will be an isolated incident. Did you see 60 minutes last week? Check out this link to the video and listen to the protectionist rhetoric by the CEO of Nucor. We need our political leaders to in the US and Canada to work together during this hard economic time. Based on the fact that Canada and the US share the longest open border in the world, there is large amounts of trade between the two countries. As stated on the CBC National last night, there is a lot of trade that is actual business to business collaboration which benefits both economies. After the Vilsack announcement yesterday, the protectionist objectives of the new US administration is very clear and becoming more of a main stream concern. It drives me crazy to watch the TV and see people in Canada cheering Obama as he drives the streets of Ottawa like it is a rock concert. President Obama in his short term in office is appearing to be a real threat to our ability to trade with our largest trading partner, the United States. Canadian agriculture requires trade with the United States to thrive and we desperately need the US to reconsider its protectionist agenda so that both countries can prosper in the long term. Like many industries based on plant science and biology, there is alot of risk. This is definitely the case with the collapse of the Chilean salmon and winter canola industry. 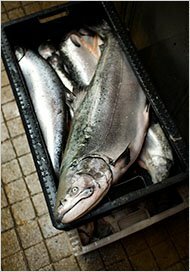 Due to lack of proper environmental practices and controls the salmon farms have been infected with a virus which is killing the salmon population. Consequently this has also significantly affected the winter canola business because its used in salmon feed rations. Compounding this issue is that there is no on farm storage in Chile. There are 40,000 acres of winter canola in chile which provides a nice rotation for wheat farmers. The virus is called infectious salmon anemia or ISA, and is threatening the waters of chile. For Chilean farmers that grow winter canola it has been a tough year because the salmon industry is struggling and many acres of winter canola have been grown without a contract and they have no on farm storage. I met with one Chilean farmer who told me that it is a very tough time for winter canola growers with the commodity crash and the lack of canola buyers. The salmon industry is working hard to rebuild itself but not without challenges as output is expected to drop 30 percent in 2009. Fish are still dying while the industry tries to increase the environmental and feeding practices of the industry. Some critics say that not enough is being done while others just want the salmon industry to stabilize so that the winter canola business has an end use market for farmers. Today I had a chance to talk to Jay Bradshaw, President of Syngenta Canada in his office in Guelph, Ontario. This is part 1 of several clips that I will be posting from my interview with Jay. In this clip, I asked Jay if there was reason for Canadian farmers to be optimistic in 2009 based on what is in the news regarding the economy and the volatility of 2008. We also discussed the characteristics of the Canadian farmer and what advantages that provides Canadian agriculture in general. Jay has been in the leadership position at Syngenta Canada for 7 years and has increased the Canadian business significantly over that period of time. The full interview will be posted in two weeks when I return from Chile. At the Tiffin Conference in Lethbridge yesterday, Rick Paskal, Chairman of Canada Gold Beef discussed the need and benefits of a truly Canadian branded beef product. Rick passionately told the crowd how Canada Gold is trying to change the way money is distributed through the value chain. The key point being to make sure that money gets back to the cow calf producer. Rick stated that the premise is to provide an age, source and production verified Canadian branded product to the rest of the world. I interviewed Rick before his address to the Tiffin Conference audience. Larry Hicks of Cattlehedging.com was one of the keynote speakers at the Tiffin Conference yesterday in Lethbridge. Larry spoke about the necessity of risk management in the beef business. Larry very clearly outlined what hedging is and that there is much more involved than calling your broker to buy or sell futures contracts. He emphasized that you must have a hedging plan in order to really obtain success. I had a chance to sit down with Larry before his Tiffin speech to discuss some of the pressing issues in the beef business and get a better idea of how he views the beef business going forward. Yesterday, I spent some time talking to Dr. Danny LeRoy, Associate Professor of Agricultural Economics at the University of Lethbridge. We spoke at great length about the economy and the affect it will have on agriculture. I was speaking to Dr. LeRoy for research that I was doing for my Grainews column. To say that Dr. LeRoy is concerned about the situation would be an understatement. Here as excerpt from the column that I wrote to be released in the next issue of Grainews. As Dr. Leroy stated to me, the two things that farmers need to be the most concerned about is currency volatility and regulation. Speculation is growing that the Canadian Dollar could be headed higher again in the next twelve months. This feeling is present due to the continued spiraling economic situation in the United States and oil is bound to catch a bullish move based on the over selling that has taken place in the last 6 months. The new administration in the US seems to be leaning more towards protectionism on agricultural products which is a significant threat to Canada. Use what we learned from country of origin labeling and be fearful of these sort of trade tactics. Sometimes all of this economic and political talk seems not applicable to our daily concerns but the reality is that it is closer to the farm than you think. With agriculture in Canada needing trade to survive in the long term, regulation and currency are huge concerns for Canadian farmers in this poor global economy. You are currently browsing the archives for the trade category.